CASPIAN SEA MONSTER ! - Upstate Berserkers vs "Gray Cardinals".... | Upstate Berserkers vs "Gray Cardinals"…. « Generational theory: the world is approaching the tip of another global crisis ! December 5th, 2014 by berserker | Posted in Out of Bounds ! – It happened near Fort Shevchenko. My friend and I went out to sea on our favorite place spearfishing. About 10 o’clock in the morning he got up and dropped anchor. My partner stayed in the boat, and I put on scuba gear, took the gun and went into depth. Less than five minutes later, a few meters away from you saw a gigantic body of beluga. Thought, here’s production! In her belly selective thirty pounds of caviar will. But to shoot her, alas, recklessly. Too great. Fish in more than five meters long and weighs more than a ton in general. Anyway, that try to harpoon a whale. Seeing eye, but the tooth is itching to do. I sailed away from the fish, even inadvertently sadanet tail. And he’s such a beluga that could easily spread our boat to pieces. Per person, it never attacks, dangerous only for its size. Calmed down – let them go home. Floating on – nothing noteworthy. Sweep past the mask only small silver kefalki. And suddenly I see – from the depths of the haze right at me rushing healthy cigar-shaped body. What is it ?! Shark! And her intention is clearly not good. First, fear gripped the whole body, I do not remember how to shot her in the head. And she did not even react. “It’s all over!” – I understood. And suddenly felt a jolt and severe back pain. Further I do not remember. Then team-mate told me that he had seen all of the boats. Monster clung to my legs and pushed to the surface. I miraculously wriggled out of her jaws. Friend grabbed me by the arm, pulled into the boat, started the engine and pulled to shore. At the hospital, I stitched bleeding and received a blood transfusion. I miraculously survived, but, you see, his right leg amputated to the knee. Curiously, the poachers did not believe. Think that they are trying to cause me to compassion, to avoid punishment. In the Caspian Sea can still catch enormous belugas. Can they attack people? Usually beluga feeds on fish, but there are cases where in the stomachs of the Caspian beluga found even pups (pups) seal. But the tragic incident that occurred soon changed point of view, even staunch skeptics. In the morgue corpse brought fans of easy money. Corpse, or rather, what‘s left of it, was caught in the juice and identified. It was a hunter black caviar, not again draws for poaching. Full body view was terrible. Flattened into a pancake face, torn flesh to the bone. On the body showed signs of a plurality of teeth. How, strong jaw were attacking creatures can be judged from the unthinkable Warped diving. Durable steel air cylinders French company «Beuchat» crumpled like a paper cup, and Prokushev! Wetsuit turned into rags. The pathologist who conducted the autopsy concluded that the diver attacked a large sea creature. Most likely – the shark. Shark? If such a tragedy happen to a person, for example, in the Pacific Ocean, no doubt would be left – it’s her teeth thing. But in the Caspian Sea sharks are not found! How could they take here? In the past, they certainly lived in the waters of the sea. Vacationers often find teeth predators in coastal sand. But it remains must be millions of years. Is it possible that some creatures managed to survive to the present day? Unlikely. But then, perhaps, in a giant enclosed sea lives are not yet known to science monster? The answer can only give a special scientific research. But while a deadly predator remains unknown, and all travelers in the Caspian Sea is better to be overcautious. Any mistake can cost a life. In 2012, in Dagestan on the Caspian Sea were found the remains of an unknown substance. At first glance, one could say that it is a mammal, he had long hair on the remains of skin and skeleton looks like a skeleton of a leopard or leopard. But the leopard or leopard such long hair do not. This story, apparently, and not continued and remained a mystery creature. Runanshahom Iranians call the mysterious inhabitants of the Caspian Sea, polucheloveka–polurusalku (the word “runanshah” means “lord of the waters“). Jafarov researcher from the Institute of Biology, Russian Academy of Sciences claims that in the age of fifteen he saw Runanshaha off Lankaran, during a night of fishing. This humanoid creature swam among the shoals of fish and waved controls the movement of the jamb. Terrified screaming teenage creature dived and disappeared. Jafarov later, he said, to meet again with this amazing creature. Runanshah lives in water, but sometimes it is seen and lying on the beach. He looks like a man of medium height, stocky build, with a pale, bluish-silver color of the skin and green as seaweed hair. Runanshaha person, though similar to a human, still has some differences – for example, there are no ears, chin, nose and large humpback, eyes big and round. Hands end only four fingers, between which stretched membrane. Feet shorter than a man, and end with something like flippers. If you believe Samed Jafarov, in addition to numerous stories of eyewitnesses, there is even a photograph taken on board the fishing trawler “Baku” (master of the vessel Ghafar Hasanov, was able to photograph Runanshaha, sailing a parallel course). 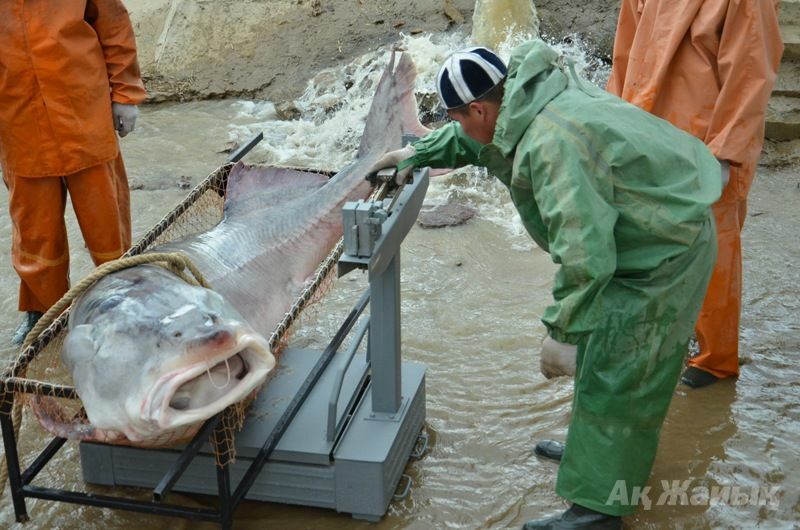 Iranian specialists did not cast doubt on the existence of a “master of the waters“, for them it is the same real being, like, say, or sturgeon Caspian seal.